It uses its claws to carve its firearm out of wood, and uses it for powerful ranged attacks. 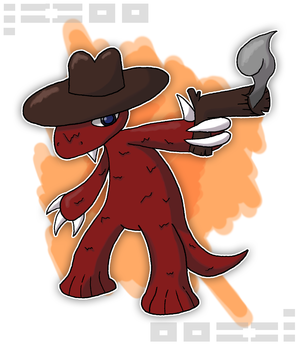 Komodraw, the Quickdraw tuxemon, is a Fire-type monster. Might fit in well inside a desert. Original design and sprites by Serpexnessie. This page was last modified on 6 April 2019, at 01:08.